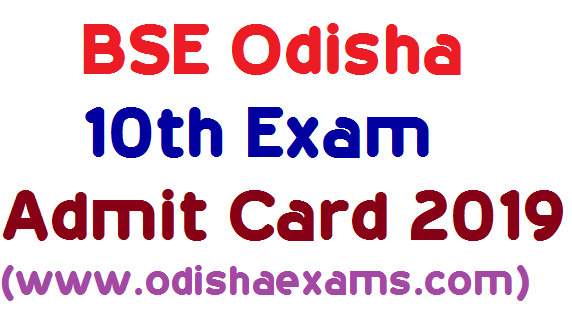 Download BSE Odisha 10th Admit Card 2019, HSC Admit Card 2019 or Matric Admit Card (Hall Ticket) 2019 at www.bseodisha.nic.in or www.bseodisha.ac.in. Students can get a direct link to download Time Table below in this post also. BSE Odisha HSC 10th Exam Admit Card 2019- Odisha Board 10th Admit Card 2019 which are to be available at BSE Odisha if uploaded by the board official website or students have to simply collect hard copy of Odisha 10th Exam Admit Card 2019 from their schools or institutions and bring it to the exam hall for appearing Class X (10th) Exam. Board of Secondary Education, Odisha will be issued the BSE Odisha 10th Exam Admit Card 2019 before the 10-15 days before the BSE Odisha 10th Exam Date 2019. Students can get the HSC Admit card from their respective school authority. The Odisha Matric Admit Card 2019 availability date will be notified by BSE Odisha website or we will update in this post also. With the latest information, the Matric admit cards will be issued on or after 8th February 2019. The School authorities can collect it from BSE Odisha officials or website. The Odisha 10th Exam Time Table 2019 is now available before issuing of Odisha 10th Exam Admit Card 2019, which is can be downloaded by students from the official website bseodisha.nic.in. The Odisha 10th Time Table 2019 may be declared Last week of December 2018. To get the good score in the Odisha 10th exam, students should practice the last year or previous years question papers of Odisha Board 10th Exam. It gives an idea about the exam pattern and students can get help to increase their weak preparation for Odisha 10th exam. First, visit the Official website of BSE Odisha. Find the latest Updates/notification Section and click on. Next, a page you find the “Odisha HSC Exam Admit Card 2019” link and click on. Now a PDF file will be downloading of Odisha HSC 10th Admit Card 2019. Take a printout of the Odisha HSC 10th Admit Card 2019 for the exam. We all are knowing the fact that what are the details mentioned on your 10th admit card and you should check details on your admit card must be correct. When your examination will be stared at the time of examination the invigilator verifies the details of your admit card. So, now students can have a look once that the list of details given below to get an idea about the information on your 10th admit card. Friends, if you have any problem regarding getting the BSE Odisha HSC 10th Admit Card 2019, please leave a comment in the comment box below and stay touch with this post for more updates about Odisha 10 Exam date 2019 or Odisha 10th Admit Card 2019.